Coming down off a whirlwind 24-hour inaugural celebration, Maryland Gov. Larry Hogan, who, yesterday, was sworn into a second term as the state’s 62nd governor, held a press conference today – a rather uncinematic event in comparison to recent festivities – to announce that his office will submit tomorrow to the General Assembly the state’s fiscal year 2020 budget. “Now it’s back to work,” Hogan exclaimed. Hogan reaffirmed his vow to bring “fiscal restraint” to state government and subsequently enumerated his 2020 budget priorities. Hogan, 62, concluded his brief budget remarks after about 15 minutes. He said he’s eager for the legislature to now begin their role in the process. Avoiding any immediate political questions, Hogan eventually relented after taking a few reporters’ questions on budget. The governor eventually took a question from veteran Baltimore Sun reporter Luke Broadwater. “Do you want to run for president?” Broadwater asked. “Well, look, I said right after the election that I was going to take more of a role in national politics; I’m becoming the chairman of the National Governor’s Association (I’m the chair-elect and the vice chair, currently). So, in that role, I have an obligation to represent all 50 governors, and I’m going to be more visible. The things I said yesterday are nothing new. I’ve been saying those things for at least a decade – about my frustrations with Washington, about civility, and about the fact that I think we ought to be reaching across the aisle, working together, to get things done. I mean, there’s almost nothing I said yesterday that was new – and maybe in the context of today’s world, it sounded like earth-shattering kinds of things. But, you know, a lot of that stuff I said four years ago in my speech, or I’ve said it other times. I just got sworn in 24 hours ago, I think. So I’m going to focus on that right now. I have no further interest at this point in time. I’m not ready to make any announcements today. Let’s put it that way. A follow-up question was tossed to the governor on whether he plans to serve out his four-year term. Hogan’s predecessor, Democrat Martin J. O’Malley, ran unsuccessfully for president in the 2016 Democratic presidential primary. O’Malley suspended his presidential campaign on Feb. 1, 2016 after a dismal performance in the Iowa caucuses. He eventually endorsed former Secretary of State Hillary Clinton over Vermont Senator Bernie Sanders (I). 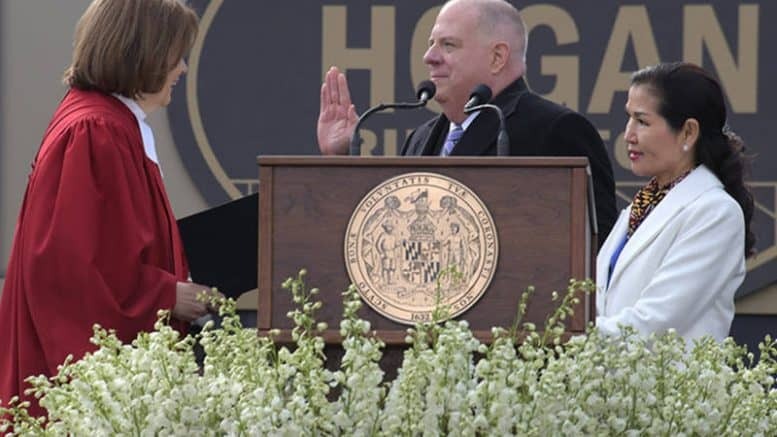 Hogan’s inaugural speech drew a sharp contrast between his personal governing style and that of Republican President Donald J. Trump’s pugnacious – and uncivil – tone and style. However, Hogan refrained from mentioning Trump by name at any point throughout his speech. “Let’s repudiate the debilitating politics practiced elsewhere – including just down the road in Washington – where insults substitute for debate, recriminations for negotiation, and gridlock for compromise; where the heat, finger-pointing, and rancor suffocates the light, and the only result is divisiveness and dysfunction,” Hogan pointedly said. Should Hogan decide to enter the 2020 presidential fray, he would likely face a hostile and unwavering Republican base, solidly in lockstep with Donald Trump and vehemently more conservative than Hogan himself. In 2016, Hogan campaigned for president on behalf of former New Jersey Gov. Chris Christie (R), joining Christie on the presidential campaign trail in New Hampshire. Christie campaigned for Hogan during Hogan’s first gubernatorial campaign and even introduced Hogan at his first inauguration in January 2015. Yesterday, however, another former 2016 Republican presidential candidate, former Florida Gov. Jeb Bush, introduced Hogan to the crowd. Hogan reflected yesterday about Bush’s late father, former President George H. W. Bush. Last month, I had the privilege of attending the memorial services for your father, our 41st president, a true American hero who represented the very best of our nation. Throughout his remarkable life, he showed us the true meaning of honor, integrity, courage, and humility. As I listened to your brother, our 43rd president, deliver his beautiful eulogy, I could not help but think back to just the year before when I lost my own dad and had the difficult job of delivering his eulogy. My father was proud to serve in Congress with George H.W. Bush. While Hogan did not rule out a future presidential bid, he did emphasize that he’s squarely focused on Maryland.